What tools do CNC Routers "replace"? Hi folks, a question If ya don’t mind. Would a tablesaw and CNC handle all of the above-mentioned production tasks? Any push in the right direction is appreciated folks, thank ya. CNC routers have typically replaced the need for pin or pattern routers, I have one that was given to me and I’m almost finished getting it ready to use. This is a smaller version of the larger overarm type that would have been used in a high capacity production shop years ago. The big plus with CNC is they can replace all of the tools you mentioned to some degree, not so much with the scroll saw or the planer, but much so with the other tools. The capacity of the CNC router table has a lot to do with it also, some have a small 18” x 18” table with an inch or two on the z-axis. Others might have several feet in the x and y direction with over a foot of z-axis travel. I’ve been thinking about getting one and the prices go up exponentially with the work envelope. The other big advantage with CNC vs. pin routers is now you no longer have patterns to store, only programs. Although I have all the tools and machines used by woodworkers, I am building a CNC router. The type of work I do can benefit from a CNC machine. Repetative jobs are easily accomplished and the accuracy can’t be beat. Programming can be a down side, but if you already do CAD on a computer, that can be transfered easily to the CNC. If all you need to do is drill a few holes or make a few cuts, a CNC is an expensive time comsuming tool. Thanks for the input fellers, helped a bunch. Now off to more CNC make and models research. I have had my CNC since November and I have to disagree with JAAune on his comment about cutting a circle on a CNC versus a band saw. My CNC has programmed instructions for cutting simple object like circles where all I have to do is enter the diameter. Additionally, the CNC will give me a perfect circle where I can then cut out the center, to make a ring, without having to drill a hole and move to a scroll/jig saw. And, I can do that with the same degree of accuracy any number of times I want. Programming a CNC is not as difficult as some may think. Partworks software, what I use, couldn’t be simpler to use and other software available allows 3D carving. With Partworks, using a 2D drawing, select the tool, select the path you want to cut, cutting offsets, cutting passes, and whether or not you want tabs and tab types and drop the file into your CNC and you are ready to cut. I will not say that a CNC will replace any dedicated tool but it will certainly augment the tools you have at your disposal. The accuracy of a CNC is unrivaled by any shop tool and that is why machine shops have used CNC machines for many years and why they have found their way into the home shop! There are things I have done on my CNC I could not do otherwise! While it is true that the CNC has all of those capabilities, that doesn’t really address the question posed by the original post. The question was not what can CNC do but rather what tools will it replace in a small-scale manufacturing environment? The short answer to that is it can replace most of them but at the risk of sacrificing flexibility and speed. Oftentimes in our shop we’re taking stuff off the CNC to do an operation on some other machine before putting it back to finish running a program. This is especially true for those who do not have an automatic tool changer or a 5-axis machine. In other words, rather than trying to figure out what can be accomplished by just a table saw and CNC, it’s better to ask what tools are most efficient at doing each step of the production process. and composite materials. There’s a whole lot more to it. Read Woodweb for a serious dose of salty realism on the business. JAAune, I said ”I will not say that a CNC will replace any dedicated tool but it will certainly augment the tools you have at your disposal.” A CNC will increase the capabilities and the skill set of your business. And, if I understand what you meant, I have to agree with you that their is no substitute for proper planning as to what tools to use at what time. Secondary operations should be kept to a minimum and moving pieces back and forth between operations is poor planning. —————————————————————————————————————————————————————————————————- Loren, I am not a small shop I am a serious hobbyist who is not afraid to try new technology, after all that’s why I went from a hand saw to a table saw, from a hand drill to a drill press and so forth. If you don’t try new technology you might as well take a hammer, not a nail gun, and nail you feet to the floor. And, I am coming down hard on you because of your condescending remark ”Read Woodweb for a serious dose of salty realism on the business.” as you appear to have little respect to fellow lumberjocks be they in business, professional, or hobbyist. OP stated his/her interest is manufacturing. Not hobby work. Loren, I accept your apology but being in manufacturing, design, and R&D for over 40 years I have seen many shops not keep up on the latest technology and be left in the dust by their competitors. This includes not only using the technology but also developing it … I could mention some prominent companies but this is not proper venue. 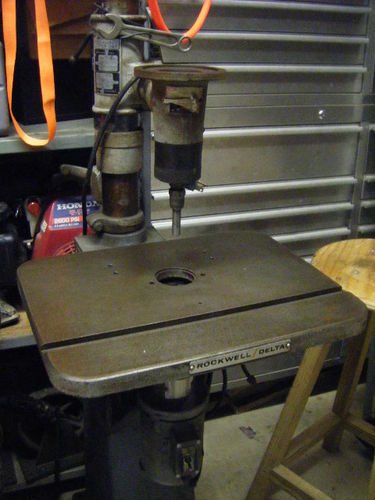 I don’t know your background, and I don’t want hazard a guess, but to me a CNC, a small entry level model, one that even a hobbyist can afford, will expand the capabilities of any small to mid size shop. So when that customer asks for that “thing” will consume your shop with repetitive operations you can farm much of the work to the CNC. Within 10 miles of my home there are two small shops, not hobbyist, that have a BT48 (Shopbot Buddy) one is a job shop that specialized in replicating carved old architectural pieces and now also makes large composite signs. The other is a guitar builder who now also engraves glass, and I assume metal too. Both of these shops fit the model described above; technology to expand their capabilities. And as well as all the usual woodworking machines and tools, I have a Laser and a CNC router…. and remember he who dies with the most tools wins…. This video may be of interest…. Think of it this way, CNC don’t necessarily replace machines, they replace the people doing that work. It could be incredibly detailed carving or the same part thousands of times to the same exact dimension. The concept that a CNC router is a machine best suited for mass production is no more than a misconception. While they are certainly capable of doing just that, they also have the ability to quickly and accurately cut out unique parts. The trick is the right software and knowing how to use it. Research how Nested Base Manufacturing can revolutionize how a cabinet shop produces box components. No two sheets are the same nest. Also, while a CNC in a cabinet shop can certainly enable an owner to reduce headcount, it is far more effective at increasing production with the existing people, while at the same time reducing errors and improving quality. All of these things can add up to a better bottom line on the balance sheet. -- Minnesota Woodworkers Guild, Past President, Lifetime member. We run an industrial CNC table router at work and I have access to it after hours for personal projects. For all but re-sawing tasks (which we do on a dedicated horizontal band saw) it eliminates most all tasks done on a traditional band saw. It also eliminates the need for pattern routing, whether it be by hand with guide bushings, or with a pin router. However, if your utilization per panel is tight, you may still want to cut a part with a rectangular perimeter on the TS or panel saw. Then you can either fixture the part on the CNC or you can cut a template on the CNC and hand rout to the template. If your doing live edge work on a big slab of rough cut wood, you can mount a face mill type bit and flatten the piece very easily on a CNC. This also comes in handy for reconditioning or flattening work benches or end grain glue ups, such as for butcher blocks. But the more you build your proficiency with the CNC, you will find that it will have an impact on the way you design your parts, as engraving a flourish, or cutting any kind of strange curve, angle, large circle, etc…. can be done without any of the difficulty that might otherwise inhibit your imagination. If your going to do the Euro-style hinges for cabinet work, you can cut your side panels with the toe kick and hinge pockets, and shelf pin holes in one set up on the sheet. BUT…. having operated CNC table routers in an industrial environment both with and without a tool changer, I can say this…. YOU REALLY WANT A TOOL CHANGER!! That’s going to take you out of the home built, or Shop Bot environment into a “real” machine. But such can be had for good prices on the auction market. Also, good software will pay for itself very quickly. We run Enroute and love it. Tossing BobCAD/CAM in the trash can was a banner day for us. Mastering your tooling, feed and spindle speed selection will take some time. Expect to burn up some expensive tooling while your on the learning curve. Despite the common prejudice, running a CNC well requires a lot of skill. It’s just a different kind of skill. I’d love to set up a 4th axis and make Corinthian columns, just for the challenge. But that’s not something we have a customer demand for. If you’re running a commercial cabinet shop, I think it would be a tough call as to whether you would benefit more from a CNC table router or a programmable panel saw, like a SELCO.